No longer the Vet's Best Kept Secret. Vet's Choice is a Cedar Oil Concentrate formulated exclusively for the Animal Health Industry for control of flying and burrowing insects common to Pets, Poultry, Dairy, Equine, Goats, Sheep, Llamas and all other domestic or exotic mammals. Treatment with Vet's Choice will provide OFF LIMIT protection from Flies, Fleas, Mosquitoes, Mites, Lice and numerous other pests. Vet's Choice is approved for use on newborn offspring and the nursing mother. 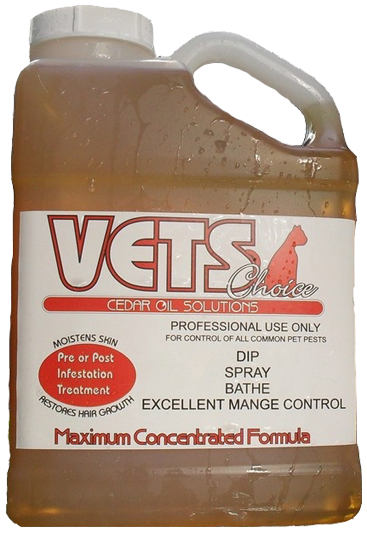 This product will successfully control Ear Mites, Mange Mites, Burrowing Mange Mites and Head and Goat Lice. Special Mange Control instructions attached. Recognized as a Flea Control alternative to chemical drop protocol.